The numbers don't show any growth in a gig economy. But that doesn't mean workers aren't poorly paid and insecure. On June 7, the Bureau of Labor Statistics (BLS) released its long-awaited contingent worker survey (CWS) of precarious or irregular employment. 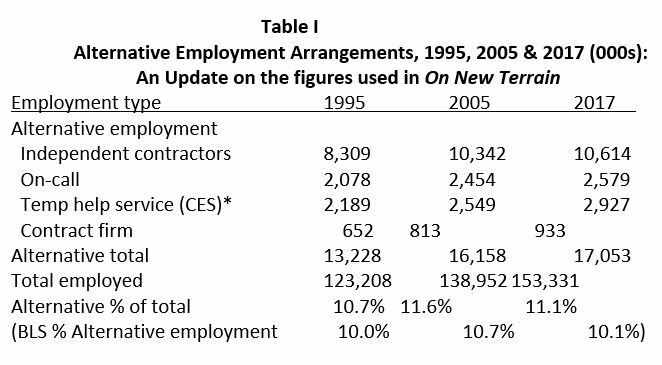 This is the first such survey of “contingent and alternative employment arrangements,” as the BLS calls the various forms of irregular work, since 2005. Despite many impressionistic claims about the growth of precarious work, a comparison between the 2005 and 2018 BLS results shows a slight decline in the proportion of these forms of irregular employment from 10.7% of the workforce to 10.1% in 2017. The total number of such jobs in the BLS survey grew from 14,826,000 in 2005 to 15,482,000 in 2017. That’s a relatively small gain of 656,000 jobs or by 4.6% over twelve years. The total number of employed workers, however, grew faster by 14,379,000 or by 10.4%. These headlines tell you the gist of the BLS’s numbers. But a few adjustments are needed to get to the bottom of what they say about the economy. For instance, in Table I, I use the Current Employment Statistics’ (CES) results for temporary help service employment instead of the BLS Current Population Survey (CPS) data on which the CWS is based. The CES’s is more accurate because it’s based on answers from about 145,000 businesses which have records of who they employ, while about half of the 60,000 or so of the answers to the BLS-CPS survey come from “proxies”; that is household members other than the job holder. In addition, I have separated out those who are part-time for economic reasons and have not used the BLS figures on “contingent” jobs which is simply a measure of whether the respondent to the survey expects to keep his or her job a year or more. The BLS measure may tell us something about the individual’s feelings of insecurity concerning employment. Yet it doesn’t tell us how long the respondent has been in this job or describe the nature of the job itself. Unfortunately, there are no CES equivalents for the other “alternative work” categories in the BLS/CPS report. In the case of “independent contractors,” however, the BLS figure for “unincorporated self-employed,” most of whom are by the BLS definition independent contractors, is quite similar over time, meaning the BLS figure for independent contractors is probably accurate. In addition, as the Economic Policy Institute notes, the BLS estimate of independent contractors is also similar to its estimates that exclude self-employed individuals who employ others. The number of “on-call” workers and those from “contract firms” are relatively small so that an undercount would not drastically affect the outcome. Naturally, the debate on precarity does not end there. Prominent reports frequently claim much higher growth of the “gig economy” than the BLS data would suggest. The most frequently cited one is a 2015 survey of “alternative work arrangements” by Lawrence Katz of Harvard and Alan Krueger of Princeton. Its authors claim that those working in “alternative work arrangements” actually composed 15.8% of the workforce in 2015. That’s a nearly 50% leap above the BLS’s 10.7% for 2005, and a much higher figure than the BLS’s 10.1% for 2017. What might explain so radical an increase? The questions in the Katz and Krueger (K&K) survey were mostly the same as the BLS survey. But their sample was not. As the authors point out their sample is much smaller: 3,850 compared to about 60,000 for the BLS/Current Population Survey (CPS). Furthermore, their sample was “a bit younger” and had “considerably higher weekly earnings than the CPS respondents.” Workers who are higher-earning, of course, are much more likely to be in “management, professional, and related occupations.” This skews the numbers towards independent contractors, on-call workers, and those provided by a contract firm. In addition, while the BLS surveys were conducted in February and May, K&K’s were done in October and November. While K&K deny any increase in precarious work during those months, this is the holiday season. Employment figures in retail and related services — much of it temporary — consistently go up this time of year. Finally, theirs was an online survey which was certain to bias it against the growing mass of lower-income workers in “traditional” jobs. K&K didn’t do surveys in 1995 and 2005 like the BLS did. But given the significant differences in the samples, if they had, it’s likely their estimates of workers in alternative work arrangements would also have been higher than the BLS’s (or the CPS’s) in those years. Consequently, the trend over time would not have seen a big increase in 2015. Comparing the 2005 BLS figures with their own 2015 figures seems invalid on the face of it. The BLS/CPS comparisons are consistent over time, K&K’s are not. It is this dubious comparison that allows K&K to assert that 95% of all new jobs between 2005 and 2015 were in “alternative work arrangements.” Again, they use a different and larger employment total for 2005 than the BLS to get a smaller total increase with which to compare their much larger 2015 figure for “alternative work arrangements.” The BLS/CPS figures show an increase of 656,000 alternative jobs from 2005 to 2017, which would amount to 4.6% of the total increase in employment. Even my higher figure of 895,000 would only be 5.5% of the total growth in employment. Another report supplying evidence of a growing gig economy is a May 2018 Federal Reserve report arguing that almost a third (31 percent) of adults engage in “gig work.” The Fed survey was done by a private firm and does not appear to be truly random. This firm used a highly demanding recruitment process for the survey sample. As a result, only 12 percent of those invited agreed to participate and only half of those (about twelve hundred) actually filled out the survey. Furthermore, the Fed survey is mainly concerned with income and takes “a broad view of the gig economy” which includes activities not usually seen as jobs, like selling things directly or on eBay, participating in a flea market, or renting a room through Airbnb, etc. Most of these income-producing “gig” activities, it notes, are in addition to a regular “traditional” job. So, for example, the tiny income I derived from royalties on an earlier book I wrote while I was working full-time at Labor Notes or later at Brooklyn College would, by this standard, have made me a part of the “gig economy” had anybody used the terms back then. This, it seems to me as I argued in On New Terrain, is not a real measure of precarious or alternative or even freelance work. If I was counted being in an “alternative work arrangement” it was because I was a full-time adjunct at Brooklyn College, not because I had a little income on the side from royalties on a book written a few years earlier. **Here I have used the BLS’s original CPS figure as the CES figure does not include age. 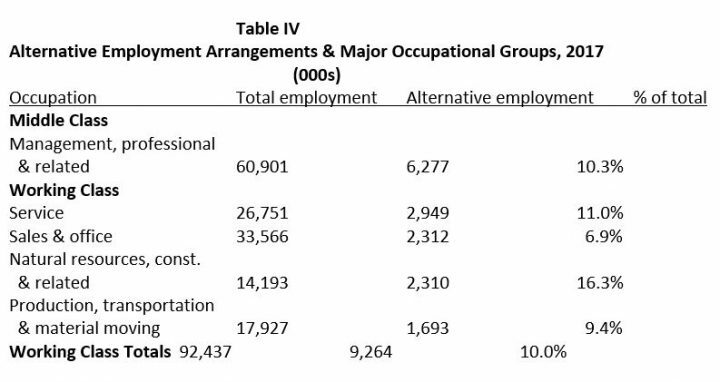 Source: BLS (2005) Contingent and Alternative Employment Arrangements, February 2005, USDL 05-1433, July 27, 2005, Tables 1 & 5; BLS (2018) Contingent and Alternative Employment Arrangements Summary, USDL 18-0942, June 7, 2018, Tables 1 & 5; BLS (2018) Current Employment Statistics—CES (National) Establishment Data, Table B-1b, Employment and earnings on nonfarm payrolls by industry sector. Significantly, the BLS/CPS figures for “Millennials” in Table II — who are usually said to be the main victims of precarity — don’t show any increase and are, in fact lower than the average of the overall proportion of workers in all alternative arrangements at 7.2%. Of course job tenure, which this BLS survey does not show, is far shorter than average for those in the twenty to thirty-four years “Millennial” cohort. Hence the experience of precarity is real. Table IV shows that both middle- and working-class occupations were affected in similar proportions, though the number of working-class people in alternative work arrangements was much larger and there was considerable variation between different occupations. In other words, the rise of irregular work impacted all classes except the pinnacles of capital. 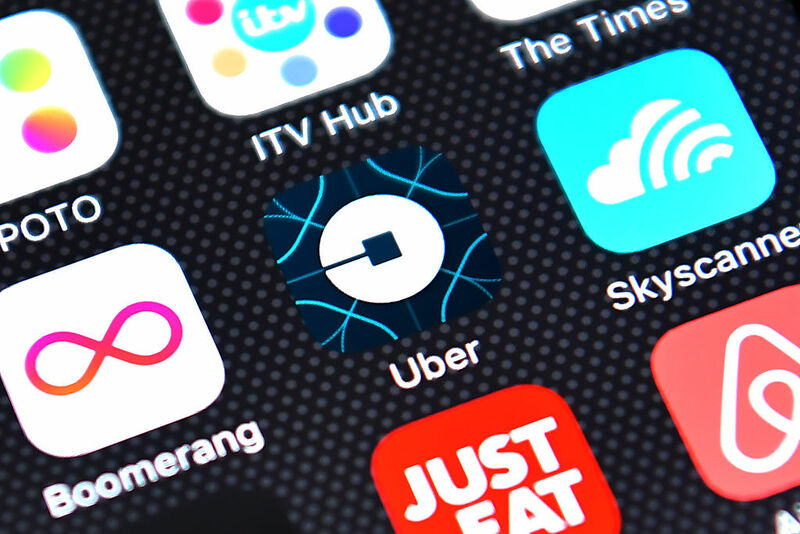 The rise of digital platform sources of work such as Uber or Task Rabbit has yet to impact the figures. According to K&K’s and other surveys they accounted for .05% of all jobs in 2015. The BLS promises to release their count of such jobs in September. Source: BLS (2018) Contingent and Alternative Employment Arrangements—May 2017, USDL 18-0942, June 7, 2018; Labor Force Statistics from the Current Population Survey, Table 11. As noted above, unincorporated self-employment closely follows “independent contractors.” “Part-time for economic reasons” shows some increase but is a cyclical phenomenon that rises in recessions and falls in recoveries. Ultimately, studies that appear to refute the BLS data are on shaky ground. The BLS data for the last few decades is the most reliable, and it provides no real evidence of an expanding gig economy. The most significant trend affecting working-class people of all ages, however, is the growth of “traditional” low-wage dead end jobs mostly among service-sector employment and the accompanying stagnation of working-class real wages that began as long ago as the 1970s. As the Economic Policy Institute has shown for the period from 1979 to 2007 those industries that have expanded, mostly services, have consistently paid less than those that have lost jobs, such as manufacturing. The National Employment Law Project estimated that by the end of 2014, 42 percent of US workers made less than $15 an hour, a proportion that would have been higher if figures had included only production and nonsupervisory workers. Despite some increases since the early 1990s, the average real weekly earnings of all production and nonsupervisory workers remained at $312.18 in early 2018 compared to $315.44 in 1972. The growth of the low-wage workforce generally has almost certainly been a major factor in heading off any dramatic increase in “alternative work arrangements” as it has become relatively cheaper to employ a low-wage worker directly and over time. In terms of working-class experience, it is more the loss of formerly well-paid industrial employment, time in the reserve army of labor, and subsequent employment in lower-paid work whether “traditional” or irregular than “gig-type” work per se. For working-class millennials it is a direct route to sporadic low-paid work eventually leading to regular dead end employment. One expanding sector in which nearly a million workers barely scrape past $15 an hour is in warehousing. Recently, an organizer for Chicago-based Warehouse Workers for Justice pointed out to me that as unemployment has declined and the wages of low-paid warehouse workers have risen somewhat during the long, slow recovery since 2009, the 40 percent extra that warehouse employers pay a temp agency for workers has become less attractive. This is particularly the case since the average cost of benefits for all nonunion service employees, a figure bloated by the inclusion of managers and professionals, was only 29 percent in March 2018. As a result, a trend toward more direct employment in warehouses in Chicago’s giant logistics cluster has become evident. This gives us a hint as to one reason why the figures on temp work and other forms of precarious employment have not grown faster than they have. Unfortunately, the transition from warehouse temp to warehouse employee, for all its advantages and even at slightly higher wages, still lands you in a low-paid, hazardous, dead end job along with millions of others — at least until they organize. The NBER study cited above makes two general points worth remembering. One is that “lifetime employment” is far from the norm in the history of capitalism and was, in so far as it was ever widespread, confined to the immediate post–World War II era of growth. Secondly, that “some of these alternative arrangements can be reasonably regular and stable, especially part-time jobs, and some full-time, regular jobs can nevertheless be quite insecure.” What we have is not so much a “gig economy” as a capitalist economy with its violent ups and downs and continuous dislocations in which both employment and income are never totally secure.